In the photo album (1940-80) there is a photo of the Arrojo family. In the back row, to the left, is Primativa Arrojo Tomargo. She lived in Donora, Pa. She had one son Joe, who was the owner of Mononghela Valley Pepsi Cola Company, in Donora. The man in the center is Manolo Arrojo. He went from Asturias to Cuba. He had one son Joe, and one daughter, her name I don't recall. Manolo worked as a streetcar conductor in Havana until he retired. (otherwise known as Anmoore, WV) She had four sons, and two daughters. There was Sam, Victor, Charles, and Joe, Angie Martinez Martinez and Lucy Martinez. The lady in front is my grandmother Aurora Arrojo Vasquez. She lived in Spelter WV, and she had five sons, two daughters. Her children were Jose Maria, Raymond, Frank, Jesus (Jessie), and Ceasar, Mary Vasquez Gonzalez, and my mother Ida Vasquez Gonzalez. This photo was taken by Primativa's son Joe, in Anmoore WV, at the home of Tarina. Manolo had come from Cuba for a visit in the early 1950s. Doing a Google search, I found a fair number of people named "Arrojo", both in the US and in Spain. I see, too, that there are a number of pueblos in Asturias named Arrojo, Arrojina, Arrojas, and that the Asturian versions would be Arroxo and Arroxu. Haciendo un busqueda por Google, encontró bastantes personas que se llama "Arrojo", tanto en los EE.UU. como en Asturias. Veo también que hay varios pueblos en Asturias que se llama Arrojo, Arrojina, Arrojas, y que en asturianu serían Arroxo y Arroxu. Soy nuevo en este foro y leyendo tu articulo sobre la familia Arrojo, queria comentarte que hay algun error en los nombres de algunas personas de las que hablas. Me permito indicarte cuales son por si algun dia necesitas buscar informacion en Asturias sobre ellos, ya que asi resultara mas sencillo. Es normal que ocurran estos errores al pasar de los year y al adaptarse a la lengua inglesa. En Asturias el nombre Primativa no existe. Seria PRIMITIVA. Tampoco hay un apellido Tomargo. Seria TAMARGO. Asi pues el nombre completo seria: PRIMITIVA ARROJO TAMARGO. El apellido de Aurora e Ida tampoco es Vasquez: Seria VAZQUEZ. Espero te sirva de ayuda y si esta intromision te parece mal, espero aceptes mis disculpas. I am new in this forum and reading your articule on the Arroyo family I want to tell you that there is an error in the names of some of the people you mentioned. Please allow me to point these out. If some day you need to look for information about them in Asturias this will make it easier for you. It is normal that errors like this occur with the passing of the years and when adapting to the English language. In Asturias the Primativa name does not exist. It would be PRIMITIVA. There is not a Tomargo last name either. It would be TAMARGO. Therefore the complete name would be: PRIMITIVA ARROJO TAMARGO. The last name of Aurora and Ida is not Vasquez, either. It would be VAZQUEZ. I hope helps you and if my interference strikes you poorly, I hope you accept my apologies. In the photo album pre 1940 family photos there is a photo of Primitiva standing along side the head stone of her husband. The spelling of her last name is as you say. Thank you for pointing that out to me. I will make a change in the spelling of her first and last name. Speaking of Arrojo: this little town is located in the county Quirós, and Asturias's only saint, San Melchor de Quirós is said to have received his First Communion in it's old parish church. Arrojo is also the home of the Bernaldo de Quirós lineage (their manor house still stands) whose founders' brutality in the 14th Century was proverbial. They established their domains through alliances with the Church and the Crown and by killing off all local gentry and seizing their land, nearly wiping out the population of the neighbouring county of Teverga, who were forced to flee. The widespread offspring of this clan nowadays are obviously normal folks who pursue conventional careers and have not been seen swinging swords or engaging in battle on horseback. The only one missing was my Grand mother Victorina Mendez. I find this information very helpful to my search for my Fathers family. 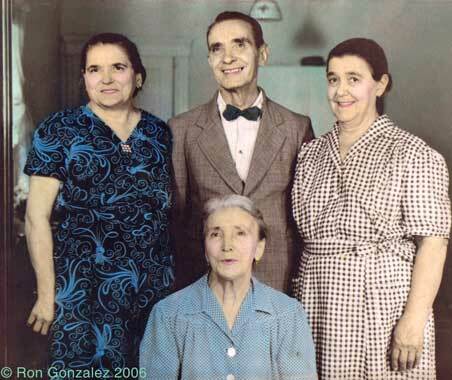 Victorina was a niece, the only one missing is her mother Adela who lived in Asturias she never made it to the US. I've been a long time without visiting the site, but I'm glad you could confirm my words.